Captain R M Cary, 1st Virginia Infantry, Company F (1st), was appointed lieutenant colonel, Provisional Army of Virginia, at Fredericksburg, Virginia, on 2 May, 1861, and colonel, 30th Virginia Infantry, on 13 June, 1861 (See the 1st Virginia Infantry). A T Harrison was appointed lieutenant colonel, 30th Virginia Infantry, on 13 June, 1861. W S Barton was appointed major, Provisional Army of Virginia, at Gloucester Point, Gloucester County, Virginia, on 17 May, 1861, and was temporarily appointed acting assistant adjutant general and assigned to command Camp Mercer, Mercer Square or Fairgrounds, between Frederick and Mercer Streets, Fredericksburg, Virginia, by General Orders No.16, Headquarters, Department of Fredericksburg, Fredericksburg, Virginia, on 28 May, 1861. The company was accepted in state service at Fredericksburg, Virginia, under the command of Captain J W Sener, on 22 April, 1861, and was mustered in state service for one year at Camp Mercer, Mercer Square or Fairgrounds, between Frederick and Mercer Streets, Fredericksburg, Virginia, on 19 May, 1861. Captain J W Sener, 30th Virginia Infantry, Company A, resigned on 15 July, 1861, and First Lieutenant G H Peyton, 30th Virginia Infantry, Company A, was appointed captain, 30th Virginia Infantry, Company A, the same day. The company was accepted in state service at Fredericksburg, Virginia, on 22 April, 1861, and was mustered in state service for one year at Camp Mercer, Mercer Square or Fairgrounds, between Frederick and Mercer Streets, Fredericksburg, Virginia, on 9 May, 1861. Captain R S Chew, 30th Virginia Infantry, Company B, was appointed lieutenant colonel, 30th Virginia Infantry, on 17 September, 1861. The company was accepted in state service at Fredericksburg, Virginia, on 25 April, 1861, and was mustered in state service for one year at Camp Mercer, Mercer Square or Fairgrounds, between Frederick and Mercer Streets, Fredericksburg, Virginia, on 23 May, 1861. The company was accepted in state service at Mount Pleasant, Spotsylvania County, Virginia, under the command of Captain S B Goodloe, on 30 April, 1861, and was mustered in state service for one year, under the command of Captain V M Johnson, on 8 May, 1861. The company was accepted in state service at Bowling Green, Caroline County, Virginia, on 26 April, 1861, and was mustered in state service for one year at Camp Mercer, Mercer Square or Fairgrounds, between Frederick and Mercer Streets, Fredericksburg, Virginia, on 11 May, 1861. The company was accepted in state service at Bowling Green, Caroline County, Virginia, on 7 May, 1861, and was mustered in state service for one year at Camp Mercer, Mercer Square or Fairgrounds, between Frederick and Mercer Streets, Fredericksburg, Virginia, on 9 May, 1861. The company accepted in state service at Chilesburg, Caroline County, Virginia, on 21 May, 1861, and was mustered in state service for one year at Camp Mercer, Mercer Square or Fairgrounds, between Frederick and Mercer Streets, Fredericksburg, Virginia, on 23 May, 1861. The company accepted in state service at Sparta, Caroline County, Virginia, on 20 April, 1861, and was mustered in state service for one year at Camp Mercer, Mercer Square or Fairgrounds, between Frederick and Mercer Streets, Fredericksburg, Virginia, on 26 April, 1861. The company was accepted in state service at Stafford Courthouse, Stafford County, Virginia, on 22 April, 1861, and was mustered in state service for one year at Aquia Creek at the junction of Aquia Creek and Potomac River, Stafford County, Virginia, by Major W H Ker, Provisional Army of Virginia, on 12 May, 1861. The company was assigned to the 47th Virginia Infantry, Company I (3rd), in September 1861. The company was mustered in Confederate service for one year at Stafford County, Virginia, on 22 July, 1861, and was assigned to the 47th Virginia Infantry, Company I (2nd), on 16 August, 1861. The company was assigned to the 30th Virginia Infantry in September 1861. The company was accepted in state service King George Courthouse, King George County, Virginia, on 27 April, 1861, and was mustered in state service for one year by Major R C Mayo, Provisional Army of Virginia, on 20 May, 1861. The company was accepted in state service at Falmouth, Stafford County, Virginia, on 23 April, 1861, and was mustered in state service for one year on 20 May, 1861. The company was assigned to the 47th Virginia Infantry, Company A, by Special Orders No.52, Headquarters, Department of Fredericksburg, Fredericksburg, Virginia, on 2 July, 1861. The company was mustered in state service at Montrose, Westermoreland County, Virginia, by Major R M Mayo, Provisional Army of Virginia, on 23 May, 1861, and was stationed at Mathias Point, on the Potomac River, seven miles northeast of He(a)mpstead, King George County, Virginia, on 27 June, 1861. The company was ordered to Brooke's Station, Safford County, Virginia, in the evening on 18 July, 1861, and was assigned as an advance guard to the 30th Virginia Infantry in the morning on 20 July, 1861. The company was ordered to Manassas Junction, Prince William County, Virginia, at 3.30 PM the same day and arrived at Camp Pickens, Manassas Junction, Prince William County, Virginia, at 8.30 PM on 21 July, 1861. The company was assigned to the 1st Virginia Battalion Cavalry at Brooke's Station, Safford County, Virginia, on 1 November, 1861, and to the 9th Vtrginia Cavalry, Company C, by Special Orders No.6, Headquarters, Aquia District, Brooke's Station, Safford County, Virginia, on 18 January, 1862. The company was organised at Fredericksburg, Virginia, in June 1858 and J W Sener was appointed captain, Fredericksburg Washington Guards, in the evening on 23 November, 1859. The company was part of the 2nd Virginia Battalion Volunteers, under the command of Major W S Barton, on 19 July, 1860, and was assigned to the 30th Virginia Infantry, Company A, on 15 June, 1861. The company was organised at Fredericksburg, Virginia, on (? ), 1859, and was part of the 2nd Virginia Battalion Volunteers, under the command of Major W S Barton, on 19 July, 1860. The company was assigned to the 30th Virginia Infantry, Company B, on 15 June, 1861. "There are three well organized and efficient companies in the place, and more forming. Capt. Sener's company of Infantry has been sent to the Potomac river." "Among the companies now at this beautiful camp are the Old Richmond Light Infantry Blues, Co. E, commanded by Capt. O. Jennings Wise; Co. F, commanded by Capt. Cary; the Mount Pleasant Rifles, Capt. Johnson; Capt. R. L. Walker's Artillery, four field-pieces; the Fredericksburg Artillery, Capt. Braxton; Co. B, Fredericksburg, Capt. Chew; Co. A, Fredericksburg, Capt. Sener. The train last evening brought the Caroline Greys, Capt. Quisenberry, a fine looking and well-drilled body of men. The camp is under the command of Capt. R. Milton Cary, of Co. F."
"The Caroline Greys drilled at this place yesterday, and are drilling again to-day. It is a company of finely formed and well-drilled young men, and destined, when brought into actual service, to make its mark high and to achieve bright and lasting honors. The Captain, R. O. Peatross, is a young man, but of true courage, and understands his duty well." "During Friday's attack, Lieut. Barnes, of the Stafford Guards, bore a message from me to Capt. Walker, and returned with a reply, his course being along the causeway over which the enemy's shot was sweeping." "On the same day too, if I remember aright, Lieut. Botts, of the Washington Guards, came to the battery, and tendered his services." "Captain Sener, of the Washington Guards, was present during the day's conflict, and volunteered to extinquish a fire kindled at the inner end of the wharf, but I witheld consent." "After landing they were attacked by the Sparta Guards and Caroline Greys and repulsed." "The Sparta Guard, Capt. Goulding, and the King George Greys, Capt. Bladen Tayloe, drove the Yankees off, killing a number on shore, besides Capt. Ward of the Freeborn. Our men secured a large quantity of rope, several Sharpe's rifles, a fine spy-glass and a thousand sand bags." "The regiment was stationed at Aquia Creek, on the Potomac, until February 1862. When the first battle of Manassas was fought, it made a forced march to that place on Sunday, but arrived too late to take part in the action." The 30th Virginia Infantry, Company H, was stationed at Camp Mercer, Mercer Square or Fairgrounds, between Frederick and Mercer Streets, Fredericksburg, Virginia, on 26 April, 1861; Company D on 8 May, 1861; Companies B and F on 9 May, 1861; Company E on 11 May, 1861; Company A on 19 May, 1861; and Companies C and G on 23 May, 1861, and the 30th Virginia Infantry was organised on 12 June, 1861. Mustered for one year, Camp Mercer, Mercer Square or Fredericksburg Agricultural Fairgrounds, between Frederick & Mercer Streets, Fredericksburg; Aquia Creek Landing, at the junction of Aquia Creek & Potomac River, Stafford County; & King George Courthouse, King George County, Virginia, 26 April & 8, 9, 11, 12, 19, 20, & 23 May; 1861: The 30th Virginia Infantry, Company H, was mustered in state service for one year at Mercer Square or Fredericksburg Agricultural Fairgrounds, between Frederick and Mercer Streets,Fredericksburg, Virginia, on 26 April, 1861; Company D on 8 May, 1861; Companies B and F for one year at Camp Mercer, Mercer Square or Fredericksburg Agricultural Fairgrounds, between Frederick and Mercer Streets, Fredericksburg, Virginia, on 9 May, 1861; Company E for one year on 11 May, 1861; Company I (1st) for one year Aquia Creek Landing, at the junction of Aquia Creek and Potomac River, Stafford County, Virginia, by Major W H Ker, Provisional Army of Virginia, on 12 May, 1861; Company A for one year at Camp Mercer, Mercer Square or Fredericksburg Agricultural Fairgrounds, between Frederick and Mercer Streets, Fredericksburg, Virginia, on 19 May, 1861; Company K for one year at King George Courthouse, King George County, Virginia, by Major R C Mayo, Provisional Army of Virginia, on 20 May, 1861; and Companies C and G at Camp Mercer, Mercer Square or Fredericksburg Agricultural Fairgrounds, between Frederick and Mercer Streets, Fredericksburg, Virginia, on 23 May, 1861. Fredericksburg, Virginia, Companies A & B, 22 & 25 April, 1861: The Fredericksburg Washington Guards, 2nd Virginia Battalion Volunteers, Company A, and the Fredericksburg Rifle Greys, 2nd Virginia Battalion Volunteers, Company B, under the command of Major W S Barton, Provisional Army of Virginia, and the Purcell Artillery were stationed at Fredericksburg, Virginia, on 22 April, 1861, and the 1st Virginia Infantry, Companies E (1st) and F (1st), the Sparta Greys, and the Caroline Light Dragoons on 25 April, 1861. Note: The 1st Virginia Infantry, Companies E (1st) and F (1st), and the Sparta Greys were stationed at Fredericksburg Courthouse, Fredericksburg, Virginia, on 25 April, 1861 (See the 1st Virginia Infantry). Fredericksburg, Virginia, to Aquia Creek Landing, at the junction of Aquia Creek and Potomac River, Stafford County, Virginia, Companies A & B, 22 April, 1861: The Fredericksburg Washington Guards and Fredericksburg (Rifle) Greys were ordered to proceed by the Richmond, Fredericksburg, & Potomac Railroad to Aquia Creek Landing, at the junction of Aquia Creek and Potomac River, Stafford County, Virginia, on 22 April, 1861. Fredericksburg to Port Conway, King George County, Virginia, Company H, 26 April, 1861: The Sparta Greys was ordered to Port Conway, King George County, Virginia, by General Orders No.4, Paragraph I, Headquarters, Department of Fredericksburg, Fredericksburg, Virginia, on 26 April, 1861. Camp Mercer, Mercer Square or Fredericksburg Agricultural Fairgrounds, between Frederick & Mercer Streets, Fredericksburg, Virginia, 27 April, 1861: The 1st Virginia Infantry, Companies E (1st) and F (1st), the Purcell Artillery, and the Caroline Light Dragoons were stationed at Camp Mercer, Mercer Square or Fredericksburg Agricultural Fairgrounds, between Frederick and Mercer Streets, Fredericksburg, Virginia, on 27 April, 1861. Camp Mercer, Mercer Square or Fredericksburg Agricultural Fairgrounds, between Frederick & Mercer Streets, Fredericksburg, Virginia, Companies B & D, 8 May, 1861: The Fredericksburg (Rifle) Greys, Company B, 2nd Virginia Battalion Volunteers; the Fredericksburg Artillery; the Mount Pleasant Rifles; the 1st Virginia Infantry, Companies E (1st) and F (1st); and the Purcell Artillery were stationed at Camp Mercer, Mercer Square or Fredericksburg Agricultural Fairgrounds, between Frederick and Mercer Streets, Fredericksburg, Virginia, under the command of Captain R M Cary, 1st Virginia Infantry, Company F (1st), on 8 May, 1861. Camp Mercer Mercer Square or Fredericksburg Agricultural Fairgrounds, between Frederick & Mercer Streets, Fredericksburg, Virginia, Company E, 8 May, 1861: The Caroline Greys arrived by the Richmond, Fredericksburg & Potomac Railroad at Camp Mercer, Mercer Square or Fredericksburg Agricultural Fairgrounds, between Frederick and Mercer Streets, Fredericksburg, Virginia, in the evening on 8 May, 1861. Note: Camp Mercer, Mercer Square or Fredericksburg Agricultural Fairgrounds, between Frederick and Mercer Streets, Fredericksburg, Virginia, was under the command of Captain R M Cary, 1st Virginia Infantry, Company F (1st), on 9 May, 1861, and Captain R M Cary, 1st Virginia Infantry, Company F (1st), was appointed lieutenant colonel, Provisional Army of Virginia, on 13 May, 1861. Lieutenant Colonel R M Cary, Provisional army of Virginia, was assigned to command the troops stationed between Camp Mercer, Mercer Square or Fredericksburg Agricultural Fairgrounds, between Frederick and Mercer Streets, Fredericksburg, Virginia, and Potomac River on 14 May, 1861. Aquia Creek Landing, at the junction of Aquia Creek & Potomac River, Stafford County, Virginia, Company I (1st), 19 & 22 May, 1861: The Stafford Guards was stationed at Aquia Creek Landing, at the junction of Aquia Creek and Potomac River, Stafford County, Virginia, on 19 May, 1861, and was ordered to continue guard duty at Naval Battery No.1, Aquia Creek Landing, at the junction of Aquia Creek and Potomac River, Stafford County, Virginia, under the command of Captain W F Lynch, Confederate States Navy, by General Orders No.13, Paragraph VI, Headquarters, Department of Fredericksburg, Fredericksburg, Virginia, on 22 May, 1861. Note: Lieutenant Colonel R M Cary was assigned to organise the Fredericksburg Washington Guards, the Fredericksburg Rifle Greys, the Gordon Rifles, the Mount Pleasant Rifles, the Caroline Greys, the Bowling Green Guards, the Chilesburg Guards, as a battalion by General Orders No.16, Paragraph III, Headquarters, Department of Fredericksburg, Fredericksburg, Virginia, on 28 May, 1861. Port Conway to King George Courthouse, King George County, Virginia, Company H, 23 May, 1861: The Sparta Greys was stationed at Camp Madison, in the vicinity of Port Conway, King George County, Virginia, on 22 May, 1861, and was ordered to King George Courthouse, King George County, Virginia, by General Orders No.13, Paragraph VIII, Headquarters, Department of Fredericksburg, Fredericksburg, Virginia, on 23 May, 1861, dated 22 May, 1861. Note: The Sparta Greys, the King George Greys, and the Westmoreland Cavalry or Lee's Light Horse were stationed at King George Courthouse, King George County, Virginia, under the command of Major R M Mayo, Provisional Army of Virginia, on 23 May, 1861. General Orders No.16, Paragraph III, Headquarters, Department of Fredericksburg, Fredericksburg, Virginia, 28 May, 1861: Lieutenant Colonel R M Cary, Provisional Army of Virginia, was relieved from the command of Camp Mercer, Mercer Square or Fairgrounds, between Frederick and Mercer Streets, Fredericksburg, Virginia, and assigned to organise the infantry and riflemen under his command into a battalion for systematic instruction at such points as shall be specially designated by General Orders No.16, Paragraph III, Headquarters, Department of Fredericksburg, Fredericksburg, Virginia, on 28 May, 1861. General Orders No.16, Paragraph V, Headquarters, Department of Fredericksburg, Fredericksburg, Virginia, 28 May, 1861: Major W S Barton, Provisional Army of Virginia, was temporarily appointed acting assistant adjutant general and assigned to command Camp Mercer, Mercer Square or Fairgrounds, between Frederick and Mercer Streets, Fredericksburg, Virginia, by General Orders No.16, Paragraph V, Headquarters, Department of Fredericksburg, Fredericksburg, Virginia, on 28 May, 1861. Skirmish at Aquia Creek Landing, at the junction of Aquia Creek & Potomac River, Stafford County, Virginia, Companies B, D, E, & G, 29 May, 1861: The Fredericksburg (Rifle) Greys, the Caroline Greys, the Mount Pleasant Rifles, and the Chilesburg Light Infantry or Guards were to proceed by the Richmond, Fredericksburg, & Potomac Railroad to Aquia Creek Landing, at the junction of Aquia Creek and Potomac River, Stafford County, Virginia, under the command of Colonel D Ruggles, infantry, Confederate States Army, on 29 May, 1861, and were accompanied by a detachment of the 2nd Tennessee Infantry and the Caroline Light Dragoons. The Fredericksburg (Rifle) Greys, the Caroline Greys, the Mount Pleasant Rifles, and the Chilesburg Light Infantry or Guards arrived at Aquia Creek Landing, at the junction of Aquia Creek and Potomac River, Stafford County, Virginia, in the evening the same day and were not engaged in the skirmish with the U.S.S. Thomas Freeborn in the evening on 29 May, 1861. The The Fredericksburg (Rifle) Greys, the Caroline Greys, the Mount Pleasant Rifles, and the Chilesburg Light Infantry or Guards arrived by the Richmond, Fredericksburg, & Potomac Railroad at Camp Mercer, Mercer Square or Fairgrounds, between Frederick and Mercer Streets, Fredericksburg, Virginia, at 5 AM on 30 May, 1861. Note: The 2nd Tennessee Infantry, the the Fredericksburg (Rifle) Greys, the Caroline Greys, the Mount Pleasant Rifles, the Chilesburg Light Infantry, and the Caroline Light Dragoons were stationed at Camp Mercer, Mercer Square or Fairgrounds, between Frederick and Mercer Streets, Fredericksburg, Virginia, on 29 May, 1861 (See the 2nd Tennessee Infantry). Skirmish at Aquia Creek Landing, at the junction of Aquia Creek & Potomac River, Stafford County, Virginia, Companies B, D, E, & G, 31 May, 1861: The Fredericksburg (Rifle) Greys, the Caroline Greys, the Mount Pleasant Rifles, and the Chilesburg Light Infantry or Guards were ordered to proceed by the Richmond, Fredericksburg, & Potomac Railroad to Aquia Creek Landing, at the junction of Aquia Creek and Potomac River, Stafford County, Virginia, under the command of Colonel D Ruggles, infantry, Confederate States Army, on 31 May, 1861, and was accompanied by the Caroline Light Dragoons. The Fredericksburg (Rifle) Greys, the Caroline Greys, the Mount Pleasant Rifles, and the Chilesburg Light Infantry or Guards arrived at Aquia Creek Landing, at the junction of Aquia Creek and Potomac River, Stafford County, Virginia, at 1 PM the same day and were not engaged in the skirmish with the U.S.S. Thomas Freeborn, Anacostia, and Resolute between 10.30 AM and 1 PM on 31 May, 1861. Note: Captain J W Sener and First Lieutenant H T Botts, Fredericksburg Washington Guards, were stationed at Naval Battery No.1, Aquia Creek Landing, at the junction of Aquia Creek and Potomac River, Stafford County, Virginia, during the skirmish with the U.S.S. Thomas Freeborn, Anacostia, and Resolute between 10.30 AM and 1 PM on 31 May, 1861, and the Stafford Guards was stationed at Naval Battery No.1, Aquia Creek Landing, at the junction of Aquia Creek and Potomac River, Stafford County, Virginia, during the skirmish between the U.S.S. Thomas Freeborn, Anacostia, Resolute, and Pawnee on 29, 31 May and 1 June, 1861. Mattox Bridge, Westmoreland County, Virginia, 30 May, 1861: The Westmoreland Cavalry or Lee's Light Horse were stationed at Mattox Bridge, Westmoreland County, Virginia, under the command of Major R M Mayo, Provisional army of Virginia, on 30 May, 1861. St Pauls Episcopal Church, one mile east of He(a)mpsted, & Mathias' Point, seven miles northeast of He(a)mpsted, King George County, Virginia, Company H, 7 & 10 June, 1861: The Sparta Greys was ordered to St Pauls Episcopal Church, one mile east of He(a)mpsted, King George County, Virginia, on 7 June, 1861, and to Mathias' Point, seven miles northeast of He(a)mpsted, King George County, Virginia, on 10 June, 1861. Note: Lieutenant Colonel R M Cary was assigned to command five companies of the 1st Arkansas Infantry and the 2nd Tennessee Infantry on 3 June, 1861 (See the 1st Arkansas Infantry). General Orders No.25, Headquarters, Virginia Forces, Richmond, Henrico County, Virginia, 8 June, 1861: The 30th Virginia Infantry was assigned to the Confederate States by General Orders No.25, Headquarters, Virginia Forces, Richmond, Henrico County, Virginia, on 8 June, 1861, and was accepted in Confederate service on 1 July, 1861. Brent’s & Sims' or Symmes' Points, at the junction of Aquia Creek & Potomac River, Stafford County, Virginia, Company C, 19 June, 1861: The 30th Virginia Infantry, Company C, was ordered to Brent’s and Sims' or Symmes' Points, opposite Aquia Creek Landing, at the junction of Aquia Creek and Potomac River, Stafford County, Virginia, in the evening on 19 June, 1861. Skirmish at Marthias' Point, seven miles northeast of He(a)mpsted, King George County, Virginia, Companies H & K, 27 June, 1861: The 30th Virginia Infantry, Companies H and K, and the Westmoreland Cavalry or Lee's Light Horse were stationed three miles south of Mathias' Point, seven miles northeast of He(a)mpsted, King George County, Virginia, under the command of Major R M Mayo, Provisional Army of Virginia, on 26 June, 1861, and were engaged in a skirmish at Mathias Point, seven miles northeast of He(a)mpsted, King George County, Virginia, in the afternoon on 27 June, 1861. Note: The 30th Virginia Infantry, Company H, under the command of First Lieutenant W M Saunders, and the Westmoreland Cavalry or Lee's Light Horse, acting as infantry, under the command of First Lieutenant R L T Beale, were engaged in a skirmish at Mathias Point, seven miles northeast of He(a)mpsted, King George County, Virginia, in the afternoon on 27 June, 1861. Hedgman's Cottage, four miles northwest of Marlboro(ugh) Point, at the junction of Potomac Creek & Potomac River, Stafford County, Virginia, Company C, 10 July, 1861: The 30th Virginia Infantry, Company C, was ordered to Hedgman's Cottage, four miles northwest of Marlboro(ugh) Point, at the junction of Potomac Creek and Potomac River, Stafford County, Virginia, on 10 July, 1861. Distribution of 30th Virginia Infantry, 17 July, 1861: The 30th Virginia Infantry, Company A, was stationed at Aquia Creek Landing, at the junction of Aquia Creek and Potomac River, Stafford County, Virginia; Companies B, D, E, and G at Marlboro(ugh) Point, at the junction of Potomac Creek and Potomac River, Stafford County, Virginia, under the command of Colonel R M Cary; Company C at Hedgman's Cottage, four miles northwest of Marlboro(ugh) Point, at the junction of Potomac Creek and Potomac River, Stafford County, Virginia; Company F at Pratt's Point, on the south bank of Potomac Creek, King George County, Virginia; Companies H and K, at Mathias Point, seven miles northeast of He(a)mpsted, King George County, Virginia; and Company I (1st) at Naval Battery No.1, Acquia Creek Landing, overlooking the Potomac River and Aquia Creek, on 17 July, 1861. Note: The 30th Virginia Infantry, Companies H and K, arrived at Marlboro(ugh) Point, at the junction of Potomac Creek and Potomac River, Stafford County, Virginia, on 19 July, 1861, and Company I (1st) was stationed at Naval Battery No.1, Acquia Creek Landing, overlooking the Potomac River and Aquia Creek, between 20 and 25 July, 1861. Marlboro(ugh) Point, at the junction of Potomac Creek & Potomac River, Stafford County, Virginia, to Manassas Junction, Prince William County, Virginia, Companies A, B, C, D, E, F, G, H, & K, 20-21 July, 1861: The 30th Virginia Infantry, Companies A, B, C, D, E, F, G, H, and K, was ordered to Manassas Junction, Prince William County, Virginia, by Special Orders No.224, Paragraph IV, Headquarters, Virginia Forces, Richmond, Henrico County, Virginia, at 3.30 PM on 20 July, 1861, dated 17 July, 186. and was accompanied by the Westmoreland Cavalry or Lee's Light Horse. Companies A, B, C, D, E, F, G, H, and K arrived at Camp Pickens, Manassas Junction, Prince William County, Virginia, at 8.30 PM on 21 July, 1861. Note: The 40th Virginia Infantry, under the command of Colonel J M Brokenbrough, arrived at Mathias Point, seven miles northeast of He(a)mpsted, King George County, Virginia, in the afternoon on 20 July, 1861, and Colonel D Ruggles, infantry, Confederates States Army, was temporarily assigned to command the Department of Fredericksburg between 19 and 23 July, 1861. After the first battle of Manassas the 30th Virginia Infantry, Companies A, B, C, D, E, F, G, H, and K, arrived at Camp Wigfall, J J Wilcoxen's Farm, east of the intersection of Union Mills and Hooe's Hill Roads, Prince William County, Virginia, in the afternoon on 23 July, 1861. Camp Wigfall, J J Wilcoxen's Farm, east of the intersection of Union Mills and Hooe's Hill Roads, Prince William County, to Brooke's Station, Stafford County, Virginia, Companies A, B, C, D, E, F, G, H, & K, 24-25 July, 1861: The 30th Virginia Infantry, Companies A, B, C, D, E, F, G, H, and K, were ordered to Brooke's Station, Stafford County, Virginia, under the command of Brigadier General T H Holmes, Confederate States Army, by Special Orders No.147, Headquarters, Army of the Potomac, Camp Pickens, Manassas Junction, Prince William County, Virginia, in the morning on 24 July, 1861, dated 22 July, 1861, and were accompanied by the 1st Arkansas Infantry, the 2nd Tennessee Infantry, the Westermoreland Cavalry or Lee's Light Horse, and the Purcell Artillery. Companies A, B, C, D, E, F, G, H, and K arrived at Brooke's Station, Stafford County, Virginia, in the afternoon on 25 July, 1861 (See the Reserve Brigade, Army of the Potomac. Note: The 30th Virginia Infantry, Companies A, B, C, D, E, F, G, H, and K, were stationed at Brooke's Station, Stafford County, Virginia, between 25 and 27 July, 1861, and arrived at Marlboro(ugh) Point, at the junction of Potomac Creek and Potomac River, Stafford County, Virginia, on 28 July, 1861. Reorganised at Goldsboro, Wayne County, North Carolina, 15, 16 & 18 April, 1861: The 30th Virginia Infantry was reorganised at Goldsboro, Wayne County, North Carolina, on 15, 16 and 18 April, 1862. Surrendered at Appomattox Courthouse, Appomattox County, Virginia, 9 April, 1865: The 30th Virginia Infantry, under the command of Major General G E Pickett, surrendered at Appomattox Courthouse, Appomattox County, Virginia, on 9 April, 1865. Westmoreland Cavalry or Lee's Light Horse, 27 June-21 July, 1861: The Westmoreland Cavalry or Lee's Light Horse and the 30th Virginia Infantry, Companies H and K, were stationed three miles south of Mathias' Point, seven miles northeast of He(a)mpsted, King George County, Virginia, under the command of Major R M Mayo, Provisional Army of Virginia, on 26 June, 1861, and were engaged in a skirmish at Mathias Point, seven miles northeast of He(a)mpsted, King George County, Virginia, in the afternoon on 27 June, 1861. The company was ordered to Brooke's Station, Stafford County, Virginia, in the evening on 18 July, 1861, and to Manassas Junction, Prince William County, Virginia, under the command of Colonel R M Cary, 30th Virginia Infantry, at 3.30 PM on 20 July, 1861. The Westmoreland Cavalry or Lee's Light Horse was accompanied by the 30th Virginia Infantry, Companies A, B, C, D, E, F, G, H, and K, and arrived at Camp Pickens, Prince William County, Manassas Junction, Virginia, at 8.30 PM on 21 July, 1861. Note: Captain T S Garnett, Westmoreland Cavalry, was to too ill for duty during the skirmish at Mathias Point, seven miles northeast of He(a)mpsted, King George County, Virginia, in the afternoon on 27 June, 1861. Colonel D Ruggles, Confederate States Army, Department of Fredricksburg, 22 April-5 June, 1861: Brevet Lieutenant Colonel & Captain D Ruggles, 5th United States Infantry, Company A, resigned on 19 April, 1861, and was appointed colonel, Provisional Army of Virginia, at Fredericksburg, Virginia, on 22 April, 1861. 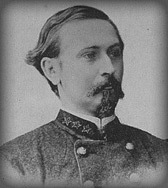 Colonel D Ruggles, Provisional Army of Virginia, was assigned to command the Department of Fredericksburg including the Potomac River between Mount Vernon, Fairfax County, Virginia, and the Rappahannock River between 22 April and 5 June, 1861, and was appointed brigadier general, Confederates States Army, on 9 August, 1861. Brigadier General D Ruggles, Confederates States Army, was ordered to Pensacola, Escambia County, Florida, by Special orders No.130, Paragraph XII, Adjutant & Inspector General's Office, Richmond, Henrico County, Virginia, on 21 August, 1861. Note: Brevet Lieutenant Colonel & Captain D Ruggles, 5th United States Infantry, Company A, was appointed colonel, infantry, Confederates States Army, dated 16 March, 1861, and was assigned to command the troops from the counties of Stafford, Spotsylvania, Caroline, King George, and Westmoreland by Special Orders No.39, Paragraph I, Headquarters of the Division, Richmond, Henrico County, Virginia, on 10 May, 1861. Brigadier General T H Holmes, Confederate States Army, Department of Fredricksburg, 5 June, 1861: Major T H Holmes, 8th United States Infantry, resigned at Fort Columbus, Governor's Island, Governor's Island, west of Buttermilk Channel, New York Harbour, opposite Brooklyn, Kings County, New York, on 5 April, 1861, dated 22 April, 1861, and was relieved from duty as superintendent of the United States General Recruiting Service, Department of the East, Headquarters, Fort Columbus, Governor's Island, Governor's Island, west of Buttermilk Channel, New York Harbour, opposite Brooklyn, Kings County, New York, by Special Orders No.57, Headquarters of the Army, New York City, New York County, New York, on 6 April, 1861 (See the United States Battalion Infantry). Brigadier General T H Holmes, Provisional Army of North Carolina, was stationed at Fayetteville, Cumberland County, North Carolina, on 16 April, 1861, and was ordered to Montgomery, Montgomery County, Alabama, on 17 April, 1861. He was appointed colonel, infantry, Confederate States Army, at Montgomery, Montgomery County, Alabama, on 20 April, 1861, dated 16 March, 1861, and was ordered to Raleigh, Wake County, North Carolina, by Special Orders No.32, Paragraph I, Adjutant & Inspectors General's Office, Montgomery, Montgomery County, Alabama, on 22 April, 1861. Brigadier General T H Holmes, Provisional Army of North Carolina, was assigned to command the Coast Defenses, Headquarters, Wilmington, New Hanover County, North Carolina, on 26 April, 1861, and the Coast Defenses, Southern Department, Headquarters, Wilmington, New Hanover County, North Carolina, by General Orders No.2, North Carolina, Adjutant General's Office, Raleigh, Wake County, North Carolina, on 27 May, 1861. Colonel C C Tew, 2nd North Carolina State Troops, was assigned to command the Coast Defenses, Southern Department, Headquarters, Wilmington, New Hanover County, North Carolina, by Special Orders No.8, North Carolina State Troops, Adjutant General's Office, Raleigh, Wake County, North Carolina, on 1 June, 1861, and Colonel T H Holmes, infantry, Confederate States Army, was appointed brigadier general, Confederate States Army, at Richmond, Henrico County, Virginia, on 5 June, 1861. Brigadier General T H Holmes, Confederate States Army, was ordered to Fredericksburg, Virginia, by Special Orders No.64, Paragraph IV, Adjutant & Inspectors General's Office, Montgomery, Montgomery County, Alabama, on the same day. Note: The Department of Fredericksburg, under the command of Brigadier General T H Holmes, was reorganised as the Aquia District, Department of Northern Virginia, on 22 October, 1861.